Συντάκτης: dikaiopolis , ημέρα Παρασκευή, 29 Ιανουαρίου 2016 και ώρα 5:54 π.μ. Denmark has one of the harshest records on Syrian refugees of any European Union nation, and this week it got even worse. 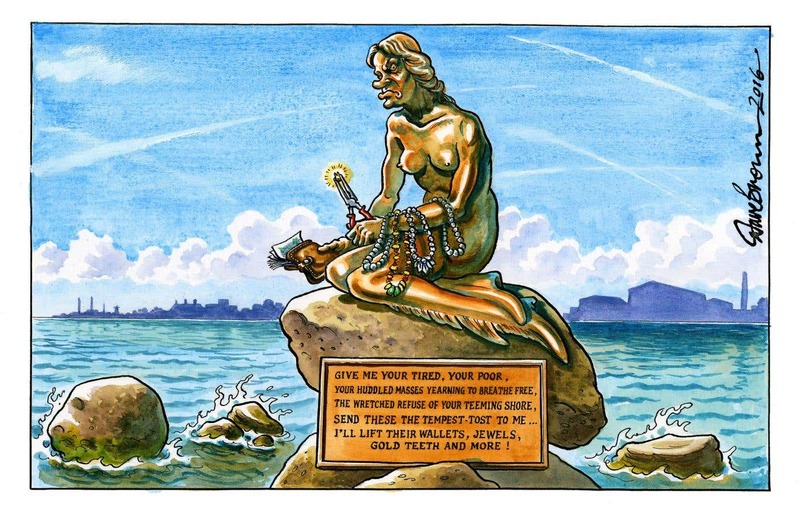 Back in December, the center-right Danish government proposed legislation that would enable immigration authorities to seize jewelry and other personal valuables from refugees. And on Tuesday, January 26th, the Danish parliament approved the legislation, 81 to 27, with support from the Social Democrats, the largest left-leaning opposition party. Under the law, any possessions worth more than 10,000 kroner — about $1,453 — will be fair game for immigration authorities to seize. This is up from the original proposal, which set a limit of 3,000 kroner or $436.13. "Foreigners will always be able to keep assets which are necessary to maintain a modest standard of living, e.g. watches and mobile phones," Mia Tang, head of press for the Danish Ministry of Immigration, Integration, and Housing explained in an email in December (Tang emphasized she's speaking on behalf of the ministry and not herself). There's a general exemption for items of sentimental value such as wedding rings — as long as their value is under a certain limit. "Assets which have a certain personal, sentimental value to a foreigner will not, as a main rule, be seized unless they have considerable value," Tang notes. The law applies both to refugees entering Denmark in the future and to ones there now. 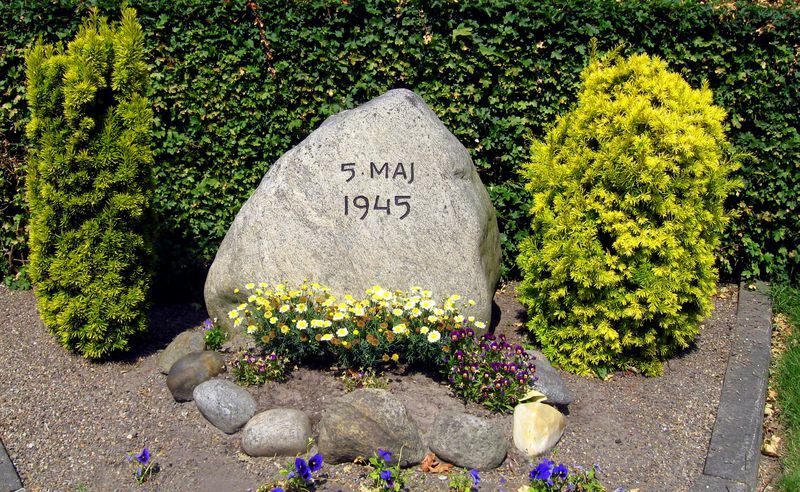 A stone commemorating the liberation of Denmark. The idea's sparked debate in Denmark since Justice Minister Søren Pind floated it in early December, arguing, "I’m talking about a situation in which a man comes along with a case full of diamonds and asks for protection in Denmark. That’s only fair." Martin Geertsen, a member of parliament from the center-right Venstre party currently leading Denmark's coalition government, condemned Henriksen, noting that the idea of seizing wedding rings "awakens terrifying historical images." Indeed it does. Denmark was occupied by Nazi Germany for five years, from 1940 to 1945, during which time Germany confiscated assets from Jewish Danes, just as it did to Jews across Europe. Danish Jews saw less seized than most nations under Nazi occupation; the Danish government successfully prevented most confiscations until 1943, and Danes who survived the concentration camps generally returned to find their homes as they had left them, as their neighbors prevented Nazis from looting them too thoroughly. But Nazi confiscations still loom large in European historical memory more generally. Obviously there is no equivalence to be drawn between Denmark's proposed policy and the Nazi seizures. But it's nonetheless a strikingly cruel measure to inflict upon a population of poor men, women, and children fleeing death and chaos in their home country. "A too high number of refugees put pressure on the Danish society and make it more difficult to ensure a successful integration of those who come to Denmark," Tang insists. Maybe so. But I've never heard of a "successful integration" that began with this kind of humiliating looting.